There are many different types of craft supplies for floral arrangements, depending on the project you are making. Most of the supplies are readily available, either on the Internet or at your local craft store. No matter what type of floral arrangement you are planning on doing, there are a few basic supplies that you will need. It is a good idea to keep these basic floral supplies on hand so that you can create a project whenever you have an inspiration. Floral foam is used to secure flowers in the container that you will be using. It is cut to fit snugly in the container with a serrated knife. Sometimes, depending on the size of your vase or basket, you will need to use several pieces and stack them up for height. You can secure the layers together with tape or waterproof tape to keep your arrangement stable. Oasis floral foam is for fresh flower arrangements. To use it, you cut it to size and then soak it in water until it has thoroughly absorbed the water. Place it in your container and arrange the flowers as you like. By keeping a little water in the container, the foam will constantly keep the flowers watered and they will stay fresh for a long time. Dry foam is used for silk flowers and dried arrangements. This is plastic based foam. It cannot be used with fresh flowers, and will not hold water like the oasis. You use the serrated knife to cut the foam to the size of your container and fit it inside. Just gently push the stems of the silk flowers into it and your arrangement will be stable forever. Spanish moss is a type of moss that grows from trees in the southern United States. It is gathered and dried and then used to cover the floral foam in artificial arrangements. To use Spanish moss, remove it from the packaging. Fluff it out and arrange it over the floral foam. Push the flower stems down through the Spanish moss.This technique is most often used with artificial arrangements, but can be used with fresh flowers if desired. Waterproof tape is used to hold floral foam, wet or dry, in place. It comes in white, green, and clear. It will stick to almost any surface, including glass. Floral stem tape is not waterproof and should not be used with moist arrangements. It is used for corsages, and boutonnières as well as silk arrangements. It can also be wrapped around a stem to strengthen it. While the supplies listed above will allow you to create almost any arrangement, there are other items that can add a special touch to your projects. Ribbon adds a finished touch to your arrangement. From elegant to romantic, different styles of ribbon will add a different feel to your finished project. Wire-edged ribbons are easy to work with because they will hold whatever shape that you put them in. Your only limits in floral supplies and embellishments are in your imagination. Vintage teacups can be wired to wreaths, or added to floral arrangements. Old toys, kitchen items, wooden spools; there is an endless array of items that can take your arrangements from boring to incredible. Making floral arrangements is a great way to a beautiful environment. Always keep some craft supplies for floral arrangements on hand, so that you can create whenever you have the time and the desire. 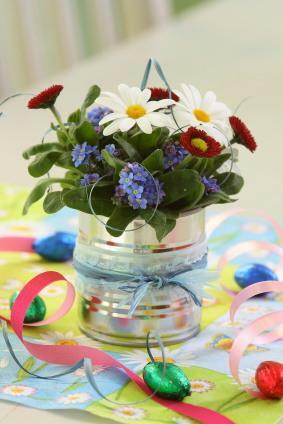 Don't be afraid to experiment and use items that you like.You can make your own special occasion floral arrangement for a fraction of the cost of buying one when you have the right floral craft supplies.